I enjoy interacting with and getting to know our patients and their families. It’s a pleasure to watch each person become more outgoing and comfortable with themselves as they get their new smile. 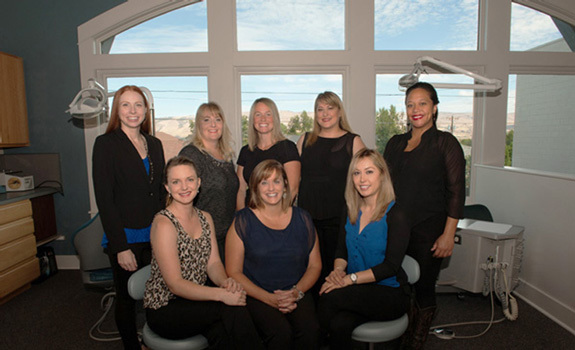 I oversee the business aspects of our practice, to ensure our wonderful team members can focus on what’s important: the happiness of our patients! I handle HR, inventory and supply management, accounts payable, and many other things that keep the office running smoothly. I’m happily married and have three active kids who keep me busy when I’m not at work. Any free time I have is usually spent lost in a good book. I love meeting our patients and parents when they’re just starting their orthodontic journey. Seeing a person’s excitement at getting a beautiful smile, and watching that excitement build, makes me smile. It’s a great feeling to be part of a team that makes real, lasting differences in people’s lives. I work with patients to make the most of their insurance benefits. I also find payment arrangements that work with a family’s budget and manage our patient accounts. During my time off, I love being with my son, especially hiking or biking. Some of my other hobbies include baking, reading, and various craft projects. I focus on making sure our patients are smiling and happy throughout their time in our care. Everyone here knows that changing one’s smile makes a lasting, positive change and we believe the process should be enjoyed. I love seeing each person’s confident, radiant smile at the end of treatment. My work involves maintaining the doctor and patient schedules, to make sure Dr. Bickler has plenty of time with each patient. I also handle a variety of other administrative tasks. I recently purchased my first home in The Dalles. Now I’m learning about home improvements as I redesign and paint each room and work in the garden. I also enjoy animals, boating, hiking, puzzles, and traveling. I truly love getting to know my patients: encouraging them out of their shells, joking with them, and opening myself to them. I feel that during their time in our care, they become our friends. When their journey in braces ends, I love experiencing their first reactions to the “new” them! I work directly with patients, and prepare them to see Dr. Bickler. I explain what he’ll be doing, then sit chairside, assisting the doctor and talking with our patient. In April 2015 I married my best friend. Together, we have two amazingly beautiful and lively children. I feel lucky to be raising my family in the beauty of the Columbia River Gorge. I love getting to know our patients and their families. Each person is important to us. I try to make sure they know how much we appreciate them coming to us for their new smile. Becoming friends with people while helping them develop the beautiful smile they deserve is fulfilling. I assist Dr. Bickler with procedures and treatment planning. I also manage our lab. My most important duty, though, is ensuring each patient receives the highest level of care. When I’m not at work I like to spend time with my family. We especially enjoy hiking and fishing. I love seeing a person’s smile and personality transform from the beginning to end of treatment. It’s a great feeling to be part of that transformation. Our patients are incredible people and I’m happy for each of them, knowing they’re going to have a healthier and happier life. I provide patient care: taking X-rays, photographs, and impressions. I also assist Dr. Bickler during procedures, including placing and removing braces. Seeing the amazing smiles at the end of treatment always makes me smile! Once a week I get together with my family for dinner and games. I love spending time with my son Khristoff when I'm not working. Some of my hobbies include dancing, hiking, exercising, and church fellowship. I love taking care of our patients and learning who they are. It’s enjoyable to watch people change along with their smile. By the time treatment is complete, they’re a whole new person who is confident and always smiling. I assist Dr. Bickler as he cares for patients. I talk with the patient about what we’re doing and act as a second pair of hands. At the end of a visit, I answer questions, provide home care instructions, and check that our patient is smiling. I have a wonderful husband, Jon, two daughters Honey, and Penelope. Our family loves the outdoors. We’re heavily involved with archery, bow hunting, and fishing the Columbia River.